South Carolina's capital and largest city is Columbia. Residents of South Carolina are referred to as South Carolinians. The unofficial nickname of South Carolina is, "The Palmetto State." The state song is " Carolina." South Carolina's state motto is "Animis Opibusque Parati," which is Latin for "Prepared in Mind and Resources," and "Dum Spiro Spero," which is Latin for "While I Breathe, I Hope." South Carolina was named in honor Charles IX of France and then Charles I and Charles II of England. Carolina is rooted in Latin and comes from the word Caroliinus. South Carolina's state bird is the Carolina Wren. The state flower is the Yellow Jasmine and the state tree is the Sable Palmetto. South Carolina is ranked sixth in population and received its statehood May 23, 1788. Georgia and North Carolina are bordering states of South Carolina. The Atlantic Ocean borders South Carolina. The major industries of South Carolina are farming (tobacco, soybeans), textiles, manufacturing chemicals, processed foods, machinery, electronics, paper products and tourism. Do you have facts that you'd like to contribute to our South Carolina page? If so, please use our contact us form. We will probably need to fact check any contributions so please provide us with a link to a source to verify it. Want to know about preparing for the South Carolina Palmetto Assessment of State Standards or PASS Standardized Tests? Are you interested in information on Homeschooling in South Carolina or a South Carolina homeschool parent support group? 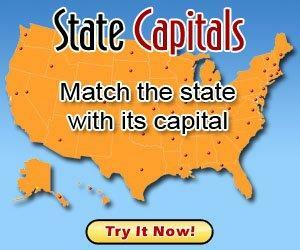 Find more South Carolina games!